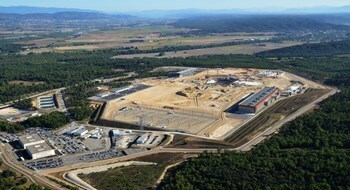 On this elevated 42-hectare platform in southern France, 35 nations are pooling their resources to build ITER. On a vast plot of land in southern France, the ITER scientific installation is taking shape. Let's take stock of construction progress, three years after works began. Saint Paul-lez Durance, France, 4 August 2010: A giant excavator scrapes at the hard earth on the exact location where the ITER Tokamak and its supporting facilities will be constructed. This first day of digging is followed by hundreds of others: some 230,000 cubic metres of rock must be dug out or dynamited and removed in order to make room for the reinforced concrete box that will protect the ITER machine. Three years and several months later, the lunar landscape of the ITER platform of 2008-2009 is a thing of the past. In its place: a busy construction site, crisscrossed by cranes, cement trucks, loaders, bulldozers and other heavy machinery in continuous motion. 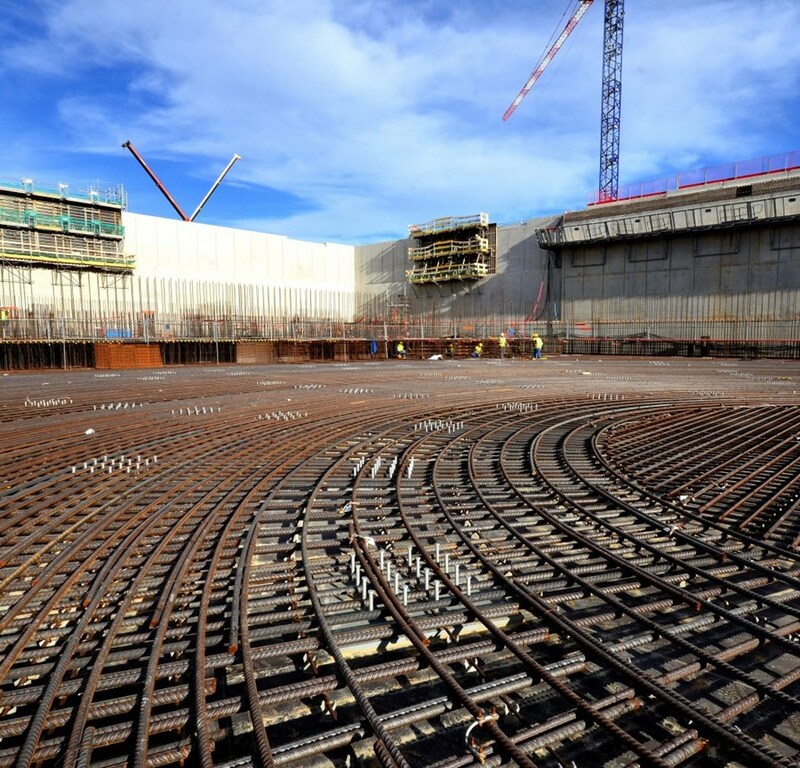 The seismic foundations of the Tokamak—reinforced basemat, retaining walls and 493 columns topped with flexible seismic pads—in March 2013. 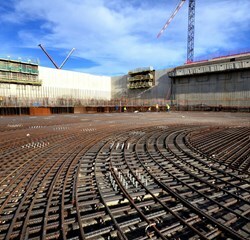 Today, they have been entirely covered over by formwork and steel reinforcement bars for the ''floor'' of the Tokamak Complex. 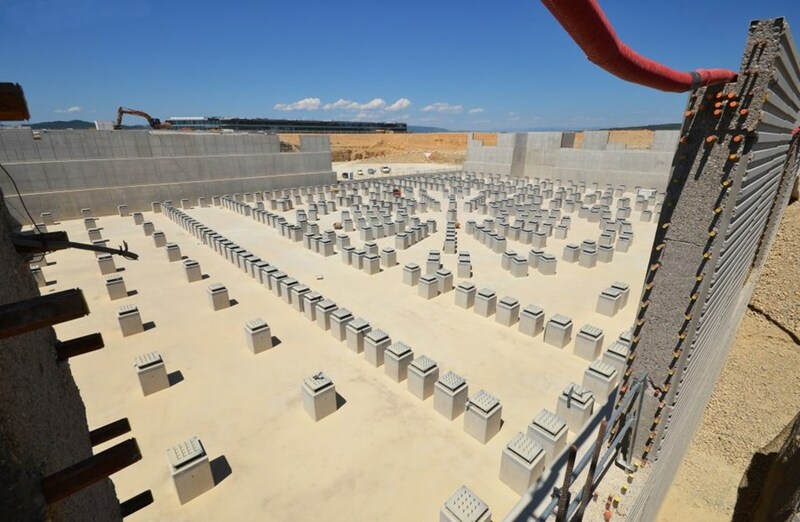 The 17-metre-deep Seismic Pit is now equipped with two concrete "floors": the first, completely covering the raw rock surface, shoulders the 493 seismic columns and pads the will protect the ITER scientific installation in the case of an earthquake. The second, anchored on top of the seismic pads, forms the floor of the Tokamak Complex, a suite of three buildings estimated at 360,000 metric tons—nearly the weight of the Empire State Building. The Poloidal Field Coils Winding Facility, completed and handed over in February 2012, will soon be equipped with tooling and equipment for the different stages of poloidal field coil fabrication (winding, insulation, assembly). 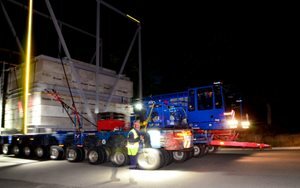 Produced in Europe, China and Russia, dozens of kilometres of niobium-titanium superconductor—the raw material for the coils—will be delivered on large spools to the southern entrance of the building. When the annular-shaped coils exit from the opposite end 18-24 months later, they will weigh between 200 and 400 metric tons. Two of the emblematic construction projects on the ITER platform in late 2013: a winding facility for the massive poloidal field coils (in red) and the Cryostat Workshop (at right). Like the other ITER components, the poloidal field magnets will pass through the Assembly Building before being integrated into the machine. This 6,000 square-metre hall will house specialized tooling for the manipulation and pre-assembly of the Tokamak components. The building's concrete basemat has now set; over two metres thick in some places, it was sized to support the weight of the very heavy tooling and overhead cranes that will be required to manipulate loads of up to 1,500 metric tons. 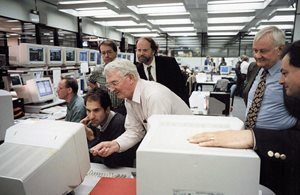 The largest single load of Tokamak assembly will be the base of the cryostat. The cryostat is a large vacuum container that will completely surround the Tokamak and its magnet systems, providing the cold environment necessary for operation (-269 °C). This key component will be installed in four large segments; the heaviest of the four, the cryostat base, will weigh 1,250 metric tons. The four cryostat segments will be assembled from 54 smaller sections in an on-site workshop that is under construction on the northeast corner of the ITER platform. 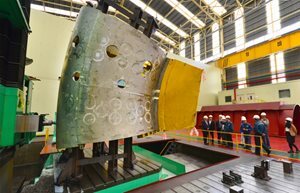 Situated in direct sight of the Assembly Building at a distance of only a hundred metres, the mammoth cryostat segments will leave the workshop on a tractable platform along rails. The Cryostat Workshop, unlike the other platform buildings that are supplied by Europe as part of its contribution to the ITER Project, falls under the responsibility of India, part of the Indian procurement of the cryostat. As the year 2013 draws to a close, the completed Seismic Pit, the Poloidal Field Coils Winding Facility, the Assembly Building and the Cryostat Workshop are the four emblematic construction projects on the ITER platform in southern France. 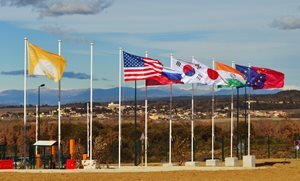 Before the end of ITER Construction, there will be a total of 39 buildings on the 42-hectare platform. 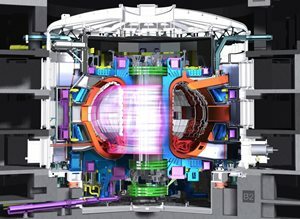 Beginning in 2015, the assembly and installation of the ITER Tokamak will mobilize a considerable workforce in addition to the numbers required for continued construction activities. It is estimated that at the peak of activities (2015-2017), over 3,000 workers, technicians and engineers will work for the realization of ITER.